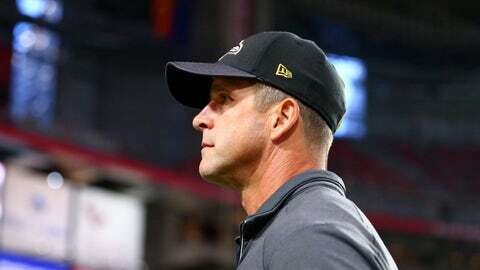 Ravens head coach John Harbaugh said all the team can do after a tough start is keep battling. The Baltimore Ravens are in the midst of the worst start in franchise history and one of the most unlucky seven-game beginnings to a season in NFL history. Baltimore has the league’s most disappointing record at 1-6, with the team’s six losses coming by a combined 30 points. According to ESPN’s Jamison Hensley, the Ravens are also the first team ever to lose six of their first seven games by only one score. The Arizona Cardinals’ eight-point win over the Ravens on Monday night represented Baltimore’s biggest defeat of the season. The Ravens dropped their first three games by a combined 14 points, losing fourth quarter leads in all three losses. An overtime win over the Pittsburgh Steelers in Week 4 momentarily righted the ship, but Baltimore has since lost three straight games by 16 combined points, including an overtime loss to the Cleveland Browns. The San Diego Chargers will travel to Baltimore to play the Ravens on Sunday. After the team’s bye in Week 9, the Ravens will host the Jacksonville Jaguars and St. Louis Rams in back-to-back weeks. Baltimore still has a chance to save its season. Only the 1970 Cincinnati Bengals have recovered from a 1-6 start to make the postseason. Could the Ravens become the next? It would take a drastic change in luck over the final nine games, but if any team could do it, it’s probably the one that hasn’t lost by more than eight points. Don’t count out these Ravens just yet.